K3Y is rated 3.9 out of 5 by 18. 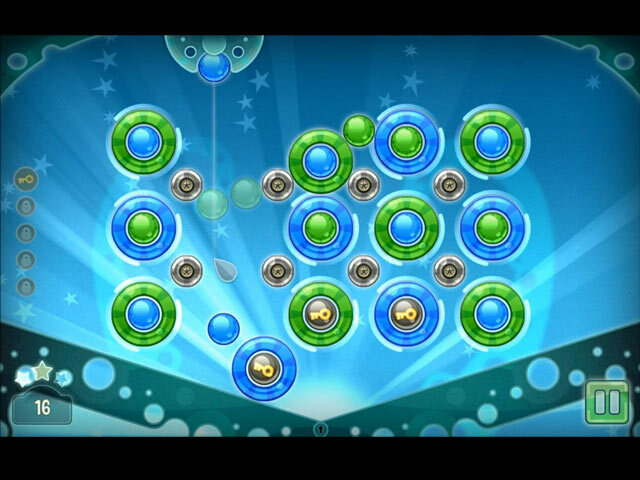 Rated 5 out of 5 by GGHss from I want more K3Ys This is a very challenging and addictive game. It is probably 70% challenge and 30% luck. It is part match 3 and part physics and planning. You have different colored balls that you must destroy to unlock the keys so they drop thru the gate at the bottom. You unlock treasures as you go but it isn't always clear what the treasures will do for you. You also come across different bumpers as the game progresses that will bounce your balls around or change colors of the balls. You need to pay attention to the keys you have completed on each level notated on the left. 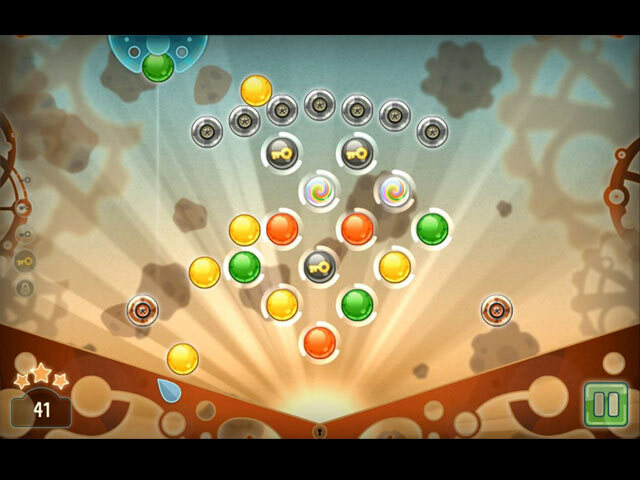 On the last key in each level you have to make sure you eliminate all the colored balls BEFORE the 3 keys are unlocked or you feed the octopus and have to start over at the top of that level. Don't get frustrated if you don't succeed the first time, just go back and try again. This is an awesome game - PLEASE make more. It keeps the brain challenged. Rated 5 out of 5 by Kikime from Create it again, Sam (One more toy, I want to start over again) I love everything about this game except one thing. I played through every level. Yes!!! That was a challenge. Now, all my stars are filled. Where is the treasure chest full of tools I once earned by playing adding a star to an unfinished level? I would like to start over again. I uninstalled and reinstalled it hoping to start the game from scratch. My stars didn't disappear. They never disappear. So I have to wait for the levels that say they are "coming soon" and I know they won't come if I don't have any data. Why do I have to wait? Beautiful colourful well lighted fun delightful neat creative visuals. Fun upbeat enjoyable music and pleasant sound effect. Best fun ever. Rated 5 out of 5 by raydog from I love this game! This game is really addictive! I love the way you have to look at each play to determine the angle and not feed the Octopus. I love that character by the way! When you think you have it going they throw a monkey wrench into the mix and make it better. I bought this game without trying it and I am happy I did! It is a different play on a match three. Very interesting! Rated 5 out of 5 by renatetoo from I love this game! I haven't played many levels yet, but I know I'm buying it. 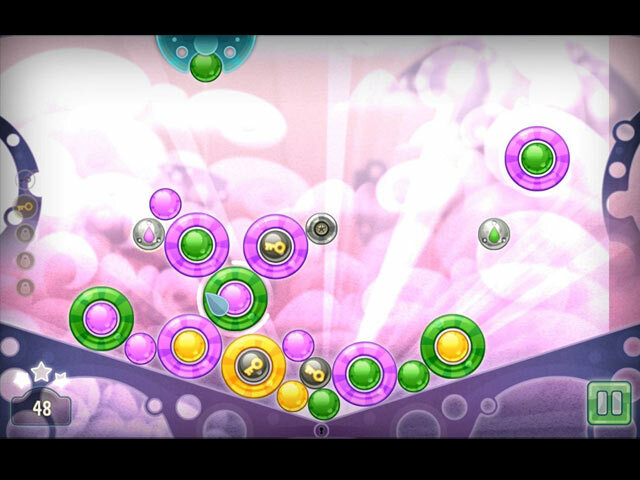 It's similar to Peggle, but much more fun because of the variety of moves and challenges. There's less chance, and lots more strategy. Storyline not needed for this type of game. Lots of people don't like music when they play a game, but I do, and I found myself moving as I played, so the style of music must have been appropriate for playing. Rated 4 out of 5 by compcrzy from Intriguing game play While this game appears simple, it does take some thought. I ended up buying it because it holds my attention and I keep replaying levels. Each level becomes harder. I haven't made it thru yet but I'll keep trying. Rated 4 out of 5 by chipps611 from There are 30 levels After level 30, everything just kind of stops, and the remaining levels shown are "coming soon". There is no end of game sequence. Seeing as this game is copyrighted 2015, good luck on seeing those ever appear. To be fair, getting to and clearing level 30 was enough of a challenge to make it worth the while. The good: It's a physics game that appeals to my inner geek, and it didn't get difficult until level 11. At that point, you're going to need to turn on your brain and do a few replays to get through some of them. Each of the 30 levels has 5 "sections" - when you get to the 5th, the goal is to not have any leftover balls fall down to the monster, to get your 3 stars. Good luck with that, especially later on. The bad: Music always on (fortunately I have speakers with a volume knob), no way to create a profile, no way to reset the whole magilla and start over from scratch once you finish the game, at least not that I can see. Overall: Worth a free credit or a couple bucks to kill an evening or two. Recommended, but only with all of the above in mind. Rated 4 out of 5 by tntgregor from Fun and very challenging I loved the first few levels, but after level 11 the game becomes so challenging that I play for a few minutes become frustrated and leave. I keep going back, though. So, worth the money. Rated 4 out of 5 by slroberts from Can't turn off the sound This is a novel game and fun to play. The biggest fault with this game is an inability to turn off the sound.